It is a great honour to welcome you to Lisbon! Lisbon is a city of science, innovation and culture. Lisbon is the cosmopolitan and modernist city of Fernando Pessoa and Almada Negreiros! The city where the first globalization movement started! The Portuguese gave “new worlds to the world” in the XV and XVI centuries and the Portuguese Discoveries have contributed in a decisive way to the development of modern science. What a fantastic location to have an open to the world Conference! We want to reach out to researchers, industrialists, policy makers and civil society from the rest of the world, with a special focus on Africa and Latin America, and exchange knowledge and experiences with them. 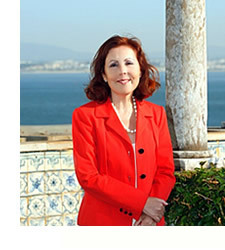 Portugal is a pioneer country in renewable energy. In March 2018, Portugal generated more renewable energy than it needed. Portugal has committed itself to being carbon neutral by 2050 and is aiming for 35% renewable energy by 2030. What an inspiring location for the 27th edition of the EUBCE! EUBCE is the world leading event and the biggest conference in the Biomass area. Biomass is part of our low-carbon future. The use of biomass for production of power, heat, transportation fuels and materials is one of the most promising options to combat climate change. As of today, biomass is part of the only feasible scenario for delivering carbon-neutral solutions for aviation (long-haul flights), shipping and heavy road transport. Biomass is also part of this fantastic transformation that the EU is leading, combating climate change and building an Energy Union that ensures that energy supply is safe, viable and accessible to all. New rules on renewables, energy efficiency and the governance of the Energy Union have been agreed by the European Parliament on 13th November 2018. This package will help Europe to sustain its world leadership in renewable energy. We will reach affordable, clean energy for all through strong investment in research, science and innovation, and deployment on industrial scale. That is why our EU Research and Innovation programme, Horizon 2020 devotes 60% of its 77 billion Euro to sustainable development and that climate-related expenditure should exceed 35% of the budget. And that is why the European Commission has proposed 100 billion Euro for the new (2021-2027) EU Research and Innovation Programme, Horizon Europe. The upcoming conference will be a meeting place to discuss all these new developments. EUBCE 2019 is about promoting research and innovation in biomass, bioenergy and biomaterials from frontier research to assessing the challenges and successes of industrial applications. EUBCE 2019 is about research and innovation but it is also about science and scientific evidence in policy making in the field of biomass, bioenergy and biomaterials. The present edition of the EUBCE will pay particular attention to the issue of science-based policy making, discussing the best ways to use the most up-to-date scientific results in the policy making cycle and will assess the successes of industrial processes using biomass for energy and materials applications toward reaching the EU 2030 and Paris targets. Let us also not forget the special focus on Africa and Latin America in 2019. For all these reasons, I am happy to invite you to the EUBCE 2019. I look forward to meeting you in Lisbon at the 27th European Biomass Conference & Exhibition from 27 – 30 May 2019. Let us move science, innovation and science-based policy making in the area of biomass and bioenergy for a bright and de-fossilized future! The Call for Abstracts for the 27th European Biomass Conference and Exhibition in Lisbon, Portugal from 27th to 30th May 2019, returned the remarkable result of 980 contributions submitted from 68 countries. The contributions cover the entire biomass value chain and come from the world’s leading biomass energy research, industry and market institutions, with a +10% of total submitted abstracts compared to EUBCE 2018. 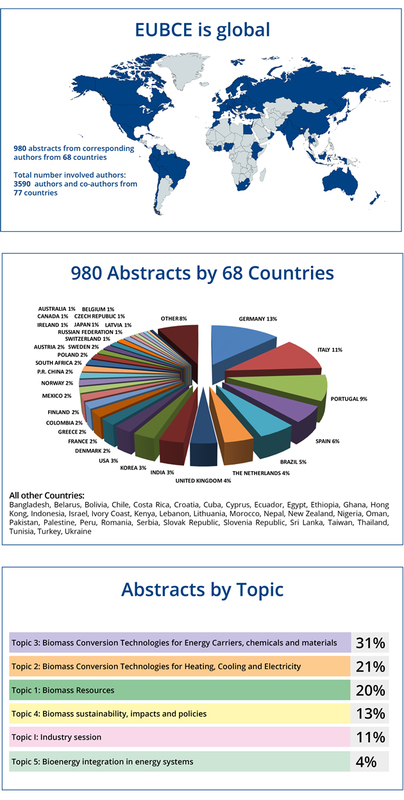 This result confirms once again the trend towards a further internationalisation of the event with almost a growth of 10% in the abstracts submission from countries outside Europe. Contributors from African and American countries represent the 17% of the total, with an increase of 27% compared to previous edition. The abstracts are currently being reviewed and scored by the EUBCE International Programme Committee made up of more than 150 leading research and industry experts coordinated by Dr. Nicolae Scarlat, European Commission, Joint Research Centre, Directorate for Energy, Transport and Climate, with the support of Kyriakos Maniatis, European Commission, DG ENER, Industry Committee Coordinator. The Programme Committee will meet in early December in Brussels to finalise the selection of plenary, oral and visual presentations to set up the Conference Programme as well as the Student Awards and the Peer-Review Journal Process. All authors will be informed on the outcome of their abstracts in December. The full programme will be available on the EUBCE website by mid-February 2019. Would like to share your latest results and research but you couldn’t make it for the Call for Papers Deadline? Please contact us at papers@etaflorence.it or by using the email button below. 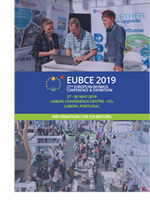 Become Exhibitor at the EUBCE 2019 and benefit from a 10% Early Bird Discount until the 15th December and select your preferred booth position.